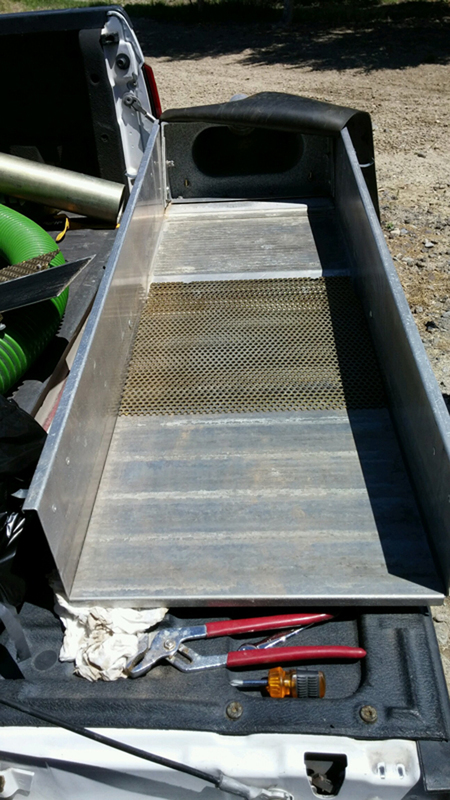 There are two sections to this dredge conversion…. #1 is the video with Dean. #2 is the breakdown and pics from Ron. I suggest you watch the → BRAND NEW VIDEO about what mats to use. Dredges have short boxes when you look at the ratio / volume of water / material being run through them. It’s really tough to get all the fine gold to settle so removing LARGE riffles really is critical. Large riffles stir up the LAYERS of a slurry while the gold is trying to settle. (BAD) You want smooth water but at the same time you need something fairly aggressive to catch the gold quickly. Because you only have about 3 seconds of sluice travel in a dredge, you need to stay fairly aggressive. 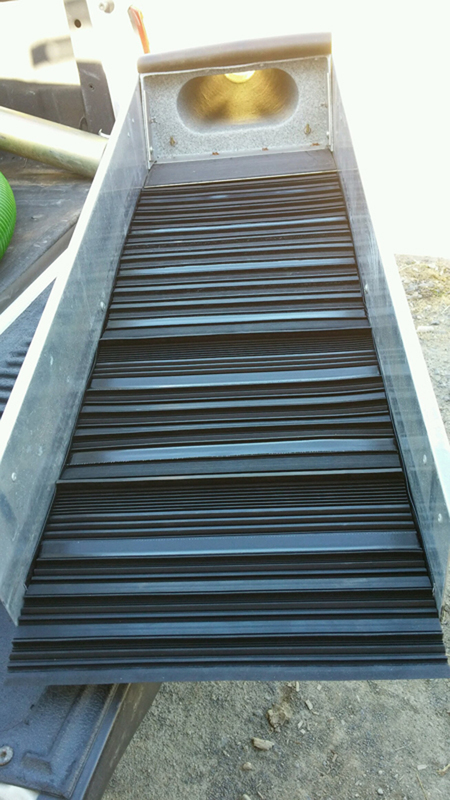 So the majority of people running our mats in dredges use mostly TALON mat. Mix in a little trimmed RiverHog and Scrubber. That’s about it. You really don’t have SLURRY TIME for finer / less aggressive matting. There is NO NEED for any UR mat or smoother running mats. 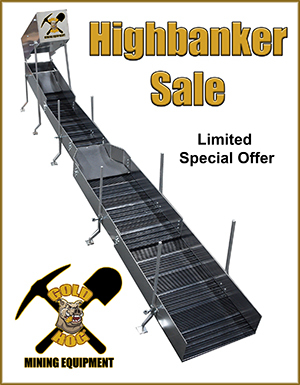 So start with Talon mat up top, then throw in a couple trimmed Riverhogs and maybe mix in a few pieces of Scrubber lower in the box. I would do this alternating with Talons. 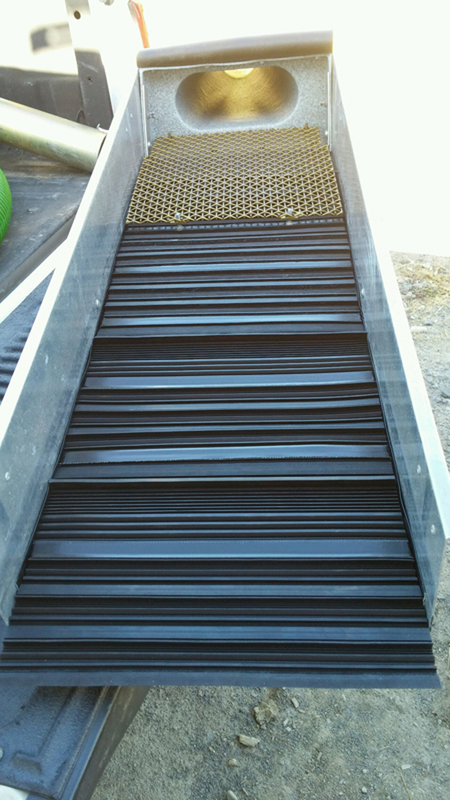 We love Talon in a dredge simply because of it’s low profile yet aggressive nature. 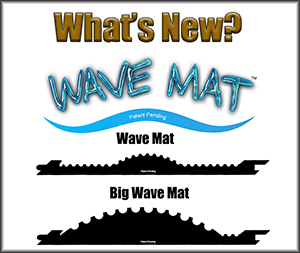 What about Big Wave mat? 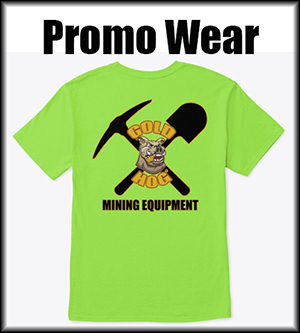 You really don’t have TIME in the sluice box. If you can add an extension to your sluice, then run Big Wave and Motherlode fairly flat. Met up with Dean just by chance. 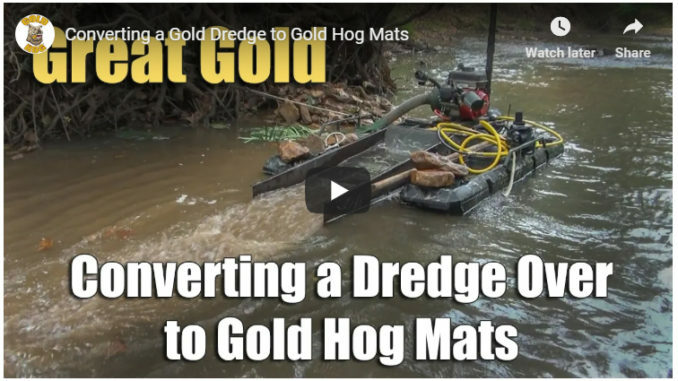 I was thrilled to find out he had a full conversion setup for his dredge using our mats. I ask to record it and put him on a spot I thought would produce. Yep… great spot, great results. Ron was nice enough to do a DETAILED explanation of how he converts over keene 3 stage boxes to our mats. Keep in mind they went from losing fines to capturing huge amounts once doing this. Also this is a 4″ dredge. First thing you will need to order 3 pieces of Talon and 1 piece of River Hog. (you get 2-6″ long by 18″ wide pieces from 1 strip of matting, your box is only 16″ wide) I said that because it can be a little confusing. When you receive the River Hog you will have to cut the taller riffle making a “throw” cut. Doc has video explaining what a “throw” and “cut” cut are. (Watch it) Then you will have to remove everything from your box. 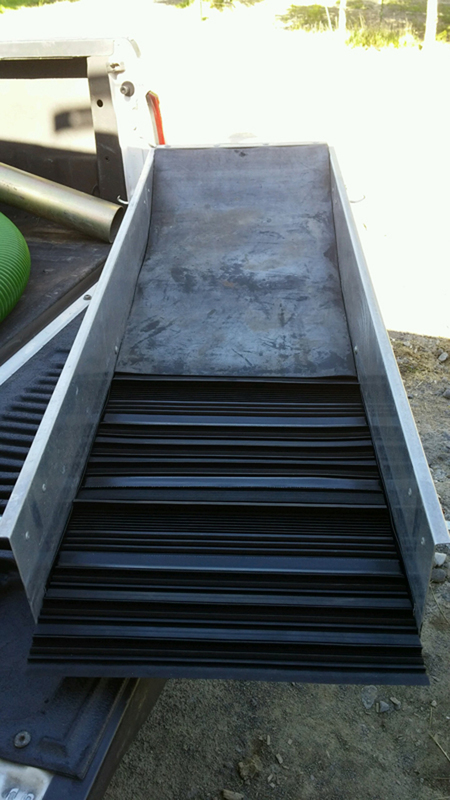 The only parts you will use is the slide plate, punch plate, the heavy metal screen, and the V mat plate. Remember the front of the box is the flare end. All I did was use the slide plate on the 3rd stage, lay it on the bottom of the box with the higher end towards the front of the box. 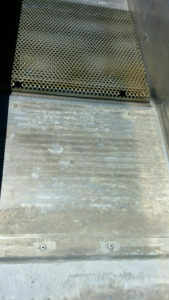 Remember to push the slide plate as far as possible towards the front of the box until it stops on the end of the box. Then use the punch plate with the curved end down and towards the front of the box and lay it over the top or higher end of the slide plate and it comes out almost level with the upper part of the box. If not bend the higher end of the slide plate down a little, until the punch plate is level with the upper part of the box. WATCH DOC’S INSTALL VIDEO. 1st 2 feet of box is gonna be Talon (4 pieces), then 1 piece of River Hog, then 1 piece of Talon, then 1 piece of River Hog, and ending with Talon. You will have about 3 inches sticking over the end of the box. You can either leave it or cut it off. Cut your matting 1/16 inch smaller than the width of your box, so measure each time to be sure of the measurement (very important). Put your first piece of Talon up to the little drop off under the V mat plate. You will have to trim part of the first piece of Talon flatter so the V mat plate will fit over the Talon so the plate is flat. I just used my razor knife to do this. I suggest just putting a piece of tape (Gorilla Tape 2 1/2″) on the bottom while fitting pieces together. Once you have all of it together and it fits alright then you can glue it and run all the tape on the bottom and down the sides. Then lay the mating over it all and there is only a little dip 3/4 the way down towards the end of the box. It should fit real tight and not need anything else to hold it in the box. If you need to because you made it a little loose you can put a bolt thru it, to hold it. I have done 6 dredges and none have needed the bolt idea. Put your heavy metal screen back on the front of the box and make sure the end of the screen is about an inch off the mat, this will keep the material from building up under the screen. Pull your dampner mat down on it and you are ready to dredge with maybe a quart of cons. Remember to run plenty of pitch as this matting will clean out better, if you are having rocks or a lot of material sitting on it, you are not running enough pitch. 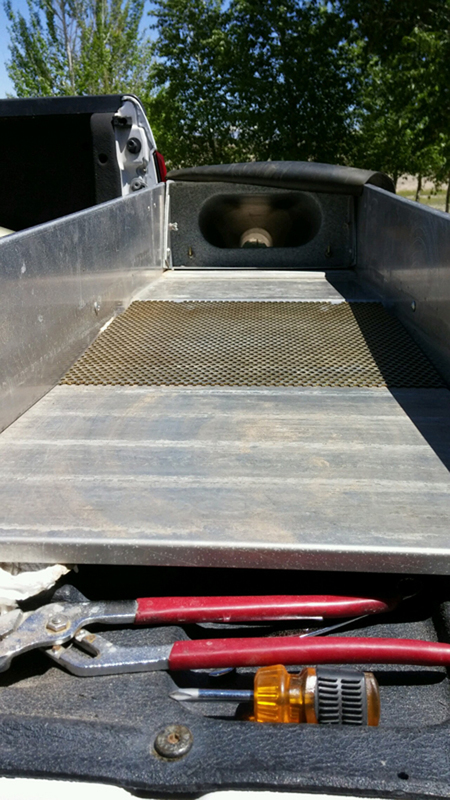 Also, run engine fast at least 3/4 throttle helps a lot, this matting likes fast water. You will have some build up to the right and left of the flare opening, I have found that to be normal, its not bad. If you want full throttle, this mat is amazing and can handle it. 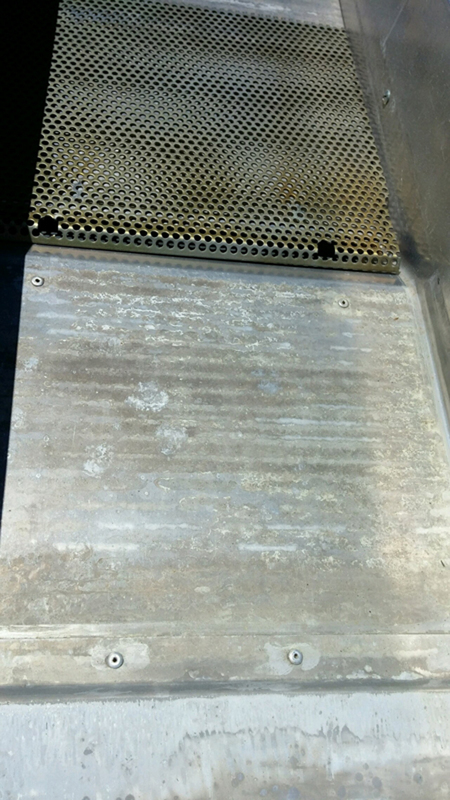 Check your box a few times and you will understand why water flow and pitch is very important. Just no complaining because you won’t have but a quart of cons now, maybe, also you can do a clean up in 3-5 minutes! Remember to put your mat all the way back up under the V plate. 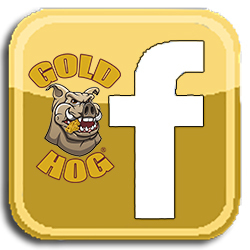 Remember to tell your friends about GOLD HOG Matting!